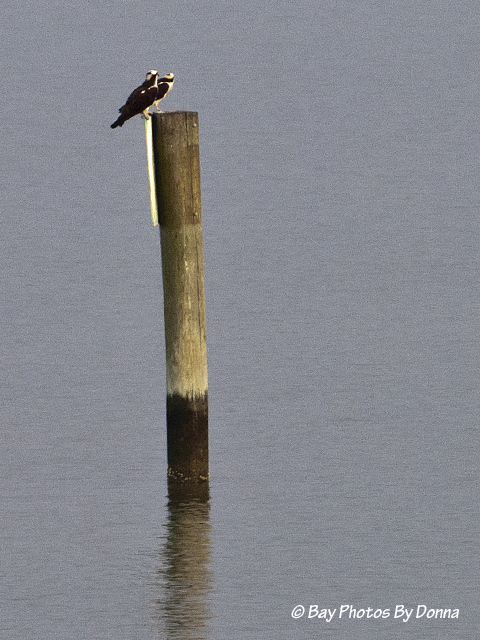 This morning before daybreak, I found our osprey pair sitting on Lippincott’s channel marker. This evening at 6:30pm arriving home, no osprey in sight. But from 7 to 8:15 pm until I could no longer see, both were on the channel marker again, preening their feathers and chillin’. At times, and I’ve seen this since they each returned, one will hang it’s head down for a while catching a little nap and rest. With the cloudy day and lateness, the photo’s not the best…. Usually osprey mate for life. On occasion, when one loses a mate, it will challenge another pair to take over that relationship. But it’s pretty tough for that to happen if the pair are both healthy and can challenge back. When they migrate in the fall, osprey migrate separately, with the female adult departing first. If there are juveniles, the male will stay behind continuing to teach and help feed them until each one departs, and then good ole dad finally gets to head south too. Each one makes the trip alone. Osprey from the northeast/mid-Atlantic usually migrate as far as northern South America, 3500 miles. The adults will return in the spring, but the juveniles will stay one and a half years before migrating back the following spring. Juvenile osprey will return to the area of their place of birth. But they do not meet up with their parents. Once they find a mate, their next step is to find a place to build their nest. It can take a year or two before they find a place that is not used by another that they like, and then they have to figure out how to build a nest, let alone what’s all that mating about. For those that followed last year remember, Oliver, Olivia, and their brood all suddenly disappeared before the end of July, more than a month than usual for osprey migration, and just less than three weeks of the chicks learning to fly. It was disappointing and frustrating not knowing what happened. In August a couple of adult ospreys were sighted, but no chicks. I contacted Lisa Mayo at Blackwater NWR for help in an explanation. Here was her response. We couldn’t come up with another explanation. And unfortunately across Marshy Creek over at CBEC, there was (and I believe still is) an active Great Horned Owl nest. Not liking what nature could have played, we hoped our osprey family were safe and had temporarily relocated further south in a safer area until migration. The nest at this point was only a home base that a chick could come to and holler for a fish (and dad Oliver was quick to show up with one!) or just perch for a while. By July/August, trees are popular to get out of the heat and into the shade. I’m hoping with fingers crossed that last year’s possible GHO scare or attack doesn’t keep them from returning to the nest. Maybe I’m just a little anxious. Once we see some nest rebuilding, I’ll feel a little better! Until next post, thanks for stopping by! I was comforted that your osprey haven’t started rebuilding yet, either. Our osprey have returned to the Upper Magothy, but are trying to get a pair of geese out of the nest so they are not rebuilding yet either. If you’d like to see my pictures (they are NOT as good as yours!) you can see them here. Thanks for your facebook link Kitty, I’ll be following your nest too! I have never seen a goose on an osprey nest before, it is quite funny but I know frustrating. Love your pair’s names, Benny & Blanche. Hopefully they can drive the goose out, or maybe someone can get to the piling and make the goose leave so the osprey can land & take possession. ‘Cuz Benny & Blanche have lots of work to do! 🙂 BTW, I am going to send your link to Lisa Mayo at Blackwater NWR to check out the videos, I’m curious if she’s ever seen a goose on an osprey nest!